I would looove to do some yoga outside! Hope your October is as good as September! To get more rest and not over-commit myself so I can be ready to attack the NYC marathon! And to get a bit more done at work - Sept I was distracted with wedding and bake sale! If you ever want to go to YTTP's bikram yoga, let me know! Impressive, Christy! I need to start crossing more off of my list for 24 Before 24. Unfortunately, I don't think I'm going to complete them all, but that's a-okay. Right? Right! I have been staring at the pumpkins at Trader Joe's recently, trying to think about how I can actually incorporate them into my food. I might just settle with pumpkin pie! 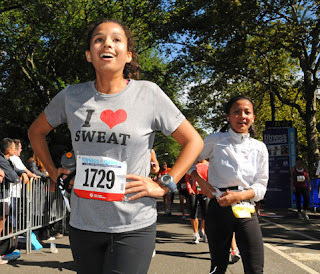 My October plans: A 10K at the end of the month + more variety in my cross-training. Hi Christy! You make me feel bad about my lack of running! Did manage to cover 11 miles this weekend but it's definitely tough during the week. Great blog. You've made me want to have a "25 before 25" list. Better get going on that....1 year left! wow girl you got a lot done last month! looks like you're staying on track. and i am so with you on consuming lots of pumpkin flavored things :) happy october love!